This entry was posted in Photography and tagged challenge, contests, famous photographers, famous photographs, game, photographers, photographs, photography, photos, quiz by Becky Green Aaronson. Bookmark the permalink. Monica, thanks for sharing the link to the sculpture in SD. Wow. That is some sculpture! As always, I love seeing your smiling “face” here on my blog. You always add pizzazz and interesting tidbits to the comments. Alfred Eisenstaedt. And the truth is, I couldn’t remember his name so I cheated and googled it. Well, until I read all the answers above, I would have guessed Franz Berko! Jane, how great to see you here! Franz would not have been a bad guess. Thanks for taking the time to leave a comment. Silly, everybody knows this was Alfred Eisenstadt. 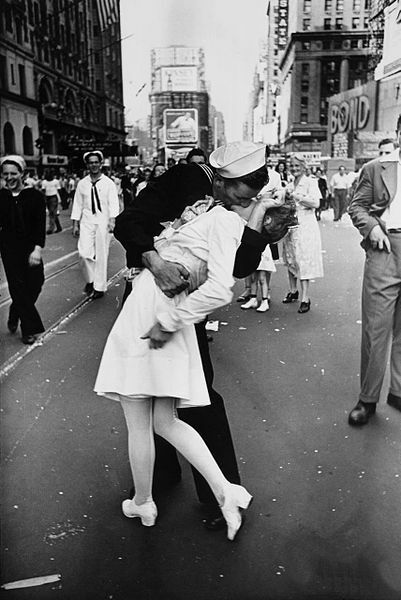 An iconic image of WW2 and a classic street photographer’s grab shot. But as we know from Cartier Bresson and others these are not just grab shots, they are pre-visualized in the photographer’s mind; that’s what makes greatness out of mere accidents. Clearly, I made this too easy, especially for somebody like you. Thanks for adding your perspective. It’s wonderful having you along adding to the conversation. Without looking at my photo books, and going on early morning memory, I’ll say Alfred Eisenstadt. Very impressive, Stu, especially early in the morning. You should probably say that professional photographers are not eligible for this contest. We would win! And take away the fun for your other readers. You are probably right. I’m thinking of other ways to do this so it’s fun, but not too easy. Alfred Eisenstaedt. I recently did a recreation of this image which is posted on my blog! Such a good photo, I love it so much. Well, that made it easy for you to answer the question since you just did a recreation of this image. Fun idea. I just took a peek. Looks like you’re up to lots of interesting things. You are crowned the winner for being the first person to correctly answer this question! Good job. By the way, I took a look at your blog. It looks like you’ve been to some interesting places around the world. I enjoyed peeking at your pictures. Thanks for stopping by.